This is the final carrier-specific financial analysis for Q1, covering JetLite. The overall market picture will be studied in a separate analysis. 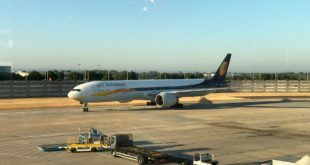 Despite the positive results shown by its parent carrier Jet Airways in the face of rising fuel costs, low fare carrier JetLite succumbed to domestic competitive pressures, posting relatively poor results in the first quarter of fiscal 2011-2012. In Q1 FY2012, JetLite slipped to a pre-tax loss of Rs. 52 million, down from a profit of Rs. 49 million in Q1 2011. Other performance metrics also showed a general negative trend when compared to the same quarter a year earlier. Revenue passengers carried increased 7.9% YOY (year-on-year) to 1.20 million. Absolute non-fuel costs were down 6.5%, while absolute fuel costs increased 46.6%; on capacity growth of 7.5%, a 3.7% drop in total hours flown, and a 2.8% drop in number of departures. R/ASK- down 12.9%, C/ASK- up 9.3%, C/ASK excl. fuel- down 13.3% (R is revenue, C is cost per ASK – Available Seat Kilometer – a measure of capacity). From these results, it is clear that JetLite felt the pain caused by over-capacity in the industry as a whole. 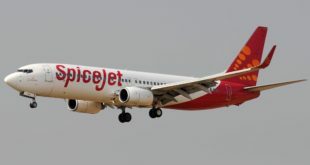 In reporting its own results, SpiceJet had mentioned that capacity growth outstripped demand growth by about 5%. With JetLite, it almost seems as if a large chunk of the related loss was accrued to them, as the rest of the carriers studied in this analysis recorded positive revenue growth domestically. Of course IndiGo, Go Air, and Air India all operate in the Indian market as well; and their results may reflect the over-capacity as well. It’s interesting to note that a lot of the changes in absolute figures were skewed slightly by a contraction of the airline as a whole. 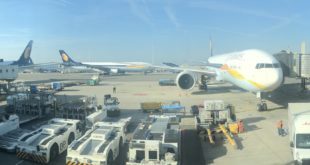 While the contraction can help explain the fall in total revenue, it also makes the airline’s total cost figures look much better year over year than they actually are, and mitigates somewhat the increase in absolute fuel costs. It is to be noted that the carrier maintained strong discipline of non-fuel costs, perhaps by increasing its average utilization per aircraft from 8.2 hours per day to 11. Additionally, the trend towards larger aircraft flying longer distances (ASKs increased while number of departures decreased) may have helped unit costs as well. Regardless, the results are still disappointing on numerous levels. Perhaps the fact that sums it up best is that JetLite now needs a seat load-factor of 98.2%, just to break even!!! With seat loads at 80.5% in Q1, that number is brought into the proper perspective. JetLite faces vigorous competition from the various LCCs in India (SpiceJet, IndiGo, etc. ), which limits its revenue growth. In the face of high fuel prices, it is then not surprising that they quickly slipped to losses. At the moment, JetLite can hope for marginal profitability in the best of times; never a good situation. Perhaps JetLite could mitigate the effects of fierce domestic competition with international flights, especially to the Gulf, but given the current uproar on Air India, will the government risk the slightly profitable Air India Express? This beneficial effect was exemplified in the results of Jet, Kingfisher, and even SpiceJet. However, access to Gulf routes may be seriously curtailed in the coming months, as MoCA wants to “protect” Air India, so international expansion may not be a feasible option.